Ngorongoro Crater Located around 160 kilometers from Arusha, the larger Ngorongoro Conservation area is characterized by highlands, and plains but the real jewel of there is the Ngorongoro Crater. Geographically what has all the way been famously known as the Ngorongoro Crater; is the largest unbroken caldera in the world. With a diameter of about 20 kilometers, 600 meters deep, and around 300 meters square kilometers in area, the Ngorongoro crater is a world heritage site under the UNESCO, and allows Multiple land use unlike the national parks. The Masai nomadic people are allowed to graze cattle in the area and with their culture and traditions they have managed to live harmoniously with the wild animals without causing any major conflict. At the canter of the Ngorongoro Crater that has now been dubbed the Eden of Africa or the eighth wonder of the world; is the Lake Makat. This soda lake that is fed by the surrounding highlands ensures a constant supply of water all year round that in turn makes the concentration of animals in this natural marvel incomparable to no other area in east Africa. No other place you ca see animals at such close range and with just a little bit of luck, one can spot the BIG 5 in one day of game drives alone. The Lerai Forest at the Crater floor is habitat for the shy leopard, and provides shade for the elephants. This forest is also a favorite spot for the troops of baboons and monkeys. Other animals that can be easily viewed includes the topis, elands, wildebeests, zebras, hippos, buffaloes, cats like serval cats, cheetahs, and lions, a lot of hyenas that can be see cooling in the afternoons at the lakes and pools. Bird life is also amazing inside the crater, with aquatic birds like flamingos cormorants, Egyptian geese, ibises among others. Other birds include hammer kops, weavers, starlings and many more. The management of the Ngorongoro Conservation area does not allow camping, and walking inside the Crater, and game drives visitors should leave the Crater floor before dusk. The Ngorongoro Crater can be included in a long, short safaris and can also be done as a day trip from Arusha town. Please let us know if you would like us to include the Ngorongoro Crater to your safari program. 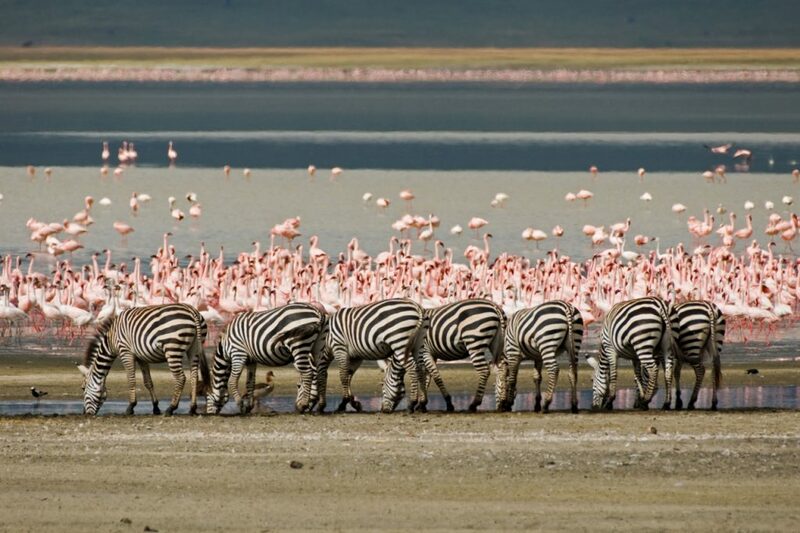 See our 3 days Safari to Ngorongoro Crater in Tanzania.